Music Legend Les Paul Invites Carl Palmer Band Guitarist, Paul Bielatowicz, Onstage For Impromptu Jam! Carl Palmer Band guitarist Paul Bielatowicz performs onstage with Les Paul & His Trio. July 5th, 2006 at the Irdium in New York City. While enjoying a rare day off while in New York City, Carl Palmer Band guitarist Paul Bielatowicz got an unexpected invitation: He was asked by 91 year-old music legend, Les Paul to join him onstage for an impromptu jam session with Les and his classic trio. 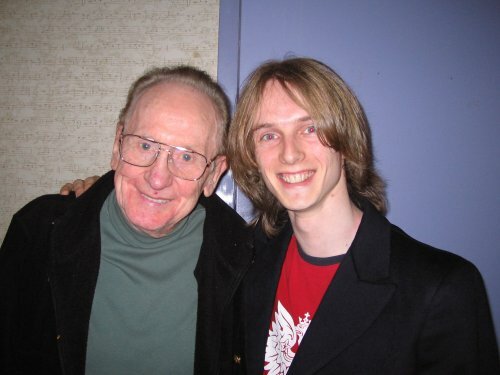 After finishing his two song set, Les Paul told the audience: “ Boy, that young man sure can play!.” The audience, in turn, gave Bielatowicz a standing ovation. The invitation came after Palmer Manager Bruce Pilato (who has known Les Paul since 1993) arranged for a backstage meet and greet with the guitar legend and Bielatowicz, before the show. 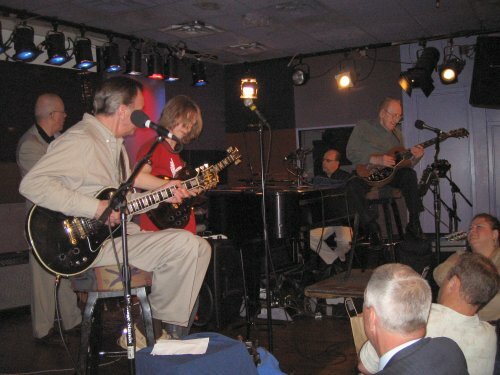 The jam with Les Paul took place while Bielatowicz was in New York City to play a sold-out show with The Carl Palmer Band at BB Kings, also in Times Square. It was one of 33 shows on the band’s first North American tour, which runs through July 3rd.